Amazon Fire TV was officially announced yesterday, and it’s basically a $99 set-top box that aims to take on Apple TV, Roku, Google Chromecast, and other similar devices. Unlike the others however, this one is powered by a 1.7-GHz quad-core Qualcomm Krait 300 processor, has 2GB of RAM, 8GB of internal storage, and even a specially designed Amazon Fire game controller to go along with it. On top of the powerful hardware, it boasts an exclusive new feature called “ASAP”, which predicts what movies and TV episodes you’ll want to watch and buffers them for playback before you hit play. Product page. Continue reading for more. 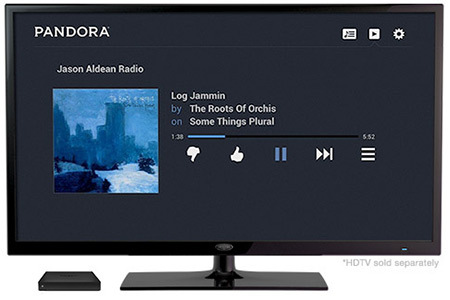 If you love music, you’ll love the millions of songs available to stream to Amazon Fire TV through Pandora, iHeartRadio, and TuneIn. You can also access your entire Amazon MP3 library, so you can enjoy any albums and songs you’ve previously purchased from Amazon. 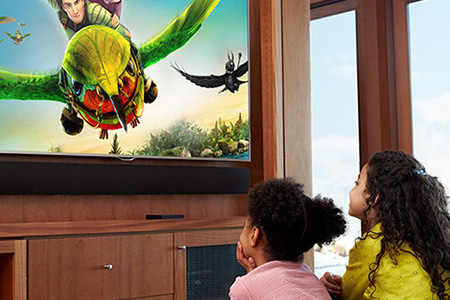 Exit to the home screen at any time and keep the music going while you share photos or play games – Fire TV will keep you updated with what’s playing each time a new song starts. Share movies, TV shows, music, and even photos playing on your tablet with everyone in your living room. What you see on your Kindle Fire HDX display is exactly what you’ll see on your big screen. Control the display from your tablet – one simple command is all it takes to let Amazon Fire TV know when to start mirroring and when to stop. Amazon FreeTime helps give parents peace of mind when it comes to safe viewing. You can create custom profiles for up to four kids, choosing the movies, TV shows, apps, and games they can access. Easily set up daily screen limits and restrict certain types of content. When kids use Amazon FreeTime, the background color and fonts change to a kid-friendly design, displaying only titles they have permission to watch. Build new worlds in Minecraft-Pocket Edition, race at top speeds in Asphalt 8, take on the family in The Game of Life, or hold off alien invasions in Sev Zero�a brand-new exclusive from Amazon Game Studios. 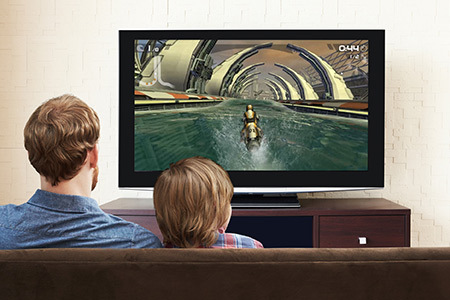 Amazon Fire TV is the easiest way to enjoy best-selling titles from Mojang, EA, Disney, Ubisoft, and others. There are over a hundred to explore right now, with thousands more coming soon. Many are free, and the average price of paid games is just $1.85. Know what you want to watch? Amazon Fire TV’s remote has a built-in mic so you can instantly search TV shows, movies, actors, directors, and genres using just your voice – no more typing with your remote to find what you want. The company is confident Amazon Fire TV’s voice search is the best you’ve ever used. You have to try it to believe it.